The Otter Outdoors Storage Hammock is similar to our 3-Pocket Cargo Net, however the Otter Storage Hammock is positioned above the anglers, utilizing space that is very convenient for in shelter storage of gloves, hats, jackets and other gear. Simply attach the four loop and belt system attachment points to your shelter frame to keep your gear placed above you near the ceiling of your shelter. 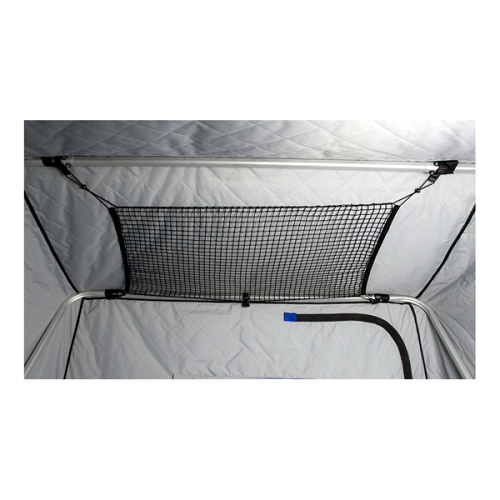 Our Storage Hammock net fit’s all Otter flip over shelter frames and will work with most non-Otter brand shelters as well. Combine this product with our 3-Pocket Cargo net for the ultimate in removable shelter storage! Combine this product with our 3-Pocket Cargo net for the ultimate in removable shelter storage!